Recently, I walked into the bathroom and saw this. 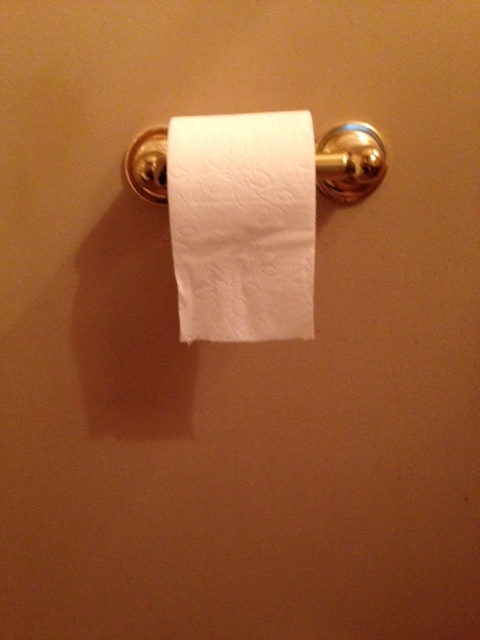 My first thought was who cares if the roll is going over or under? At this point I just want it to be on the toilet paper holder. OK. 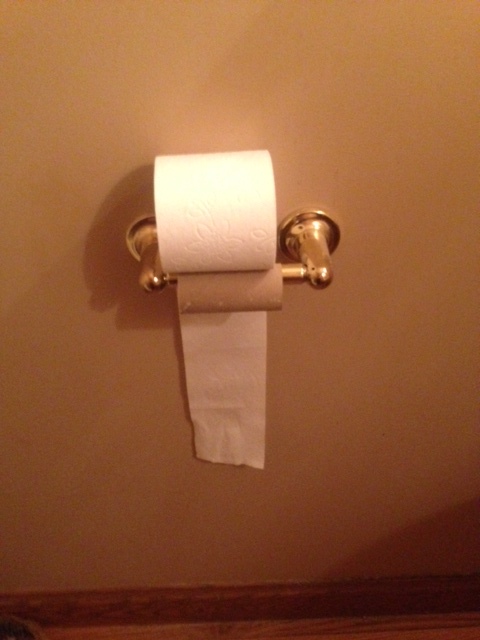 I lie, I want the roll to go over. But how lazy do you have to be to not even put it on the holder? I know you’re busy and you have things to do. That’s probably why you couldn’t spare an extra 30 seconds to actually put the toilet paper on the toilet paper holder. It’s really not that hard. And if you want to really make your mom happy, all you have to do is put the toilet paper on the toilet paper holder. It’s not rocket science and really, it’s quite ridiculous how little one must do to make a woman happy. Or at least this woman. I guess I can’t speak for the other eleventy million of us out there. A few days later, I found this. 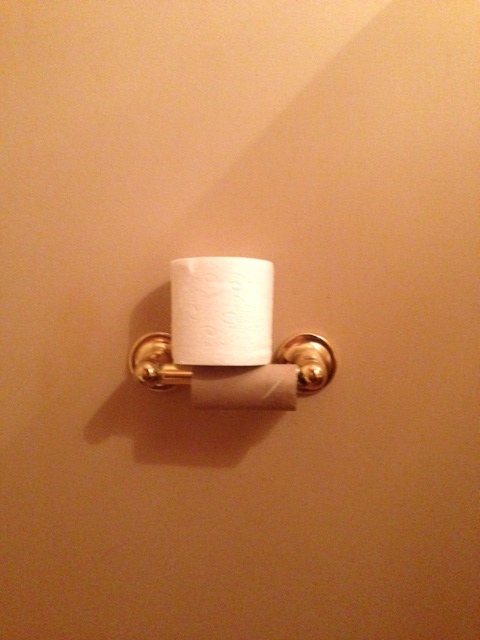 The roll was lying on the holder, so it functioned somewhat like it was on the holder. Granted it was rudimentary, but it felt like progress. I studied Darwin; I know evolution takes time. It made me somewhat happy. About a week later, I find the roll finally on the holder! And in the over position to boot! Hallelujah! I think I may have even heard angels singing on high when I walked into the bathroom. I want to thank my kids for paying attention to my Facebook posts and adjusting their behaviors accordingly. I can only imagine this is what it feels like to win an Oscar. Ah! I never put my toilet paper on the holder. I just place it as shown in the first picture. But I have a reason: if I install it on the holder, my car can’t resist unwinding it – regardless of whether it goes under or over! But if I just place it on top of the holder, she has not interest and leaves it alone! Your car unwinds it?! What kind of car do you have? I have friends who have cats and they put the roll on going behind so the CAT cannot unroll it, but if you did mean car I have to ask as Helle did ,,, What kind of car do you have and how the heck does it get in the house? Can I tell you that I laughed my way through this post! It is funny because it is TRUE!! Reblogged this on judging baristas, and them judging me.